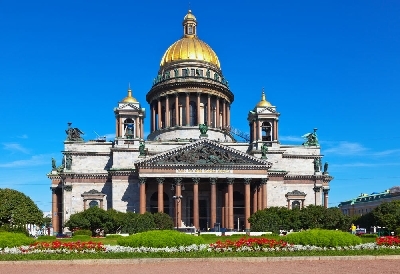 Saint Isaac's Cathedral is the biggest Orthodox church in Saint-Petersburg, has the museum status. 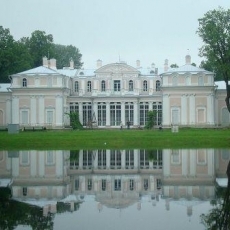 It is the prominent monument of Russian classicism style. Wonderful panorama opens over the city from the colonnade. Entrance tickets: for adults - 250 RUR, for ISIC holders - 150 RUR, for young people (7 to 18 years old) - 50 RUR. Audio guide (in Russian, English, German, French, Italian, Spanish, Finnish, Japanese, Chinese and Korean) - 200 RUR. 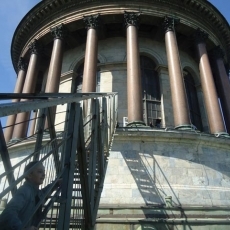 St Isaac’s Cathedral Colonnaded Walkway. 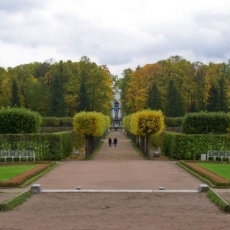 Audio excursion "Panoramic View of St Petersburg" - 150 RUR. 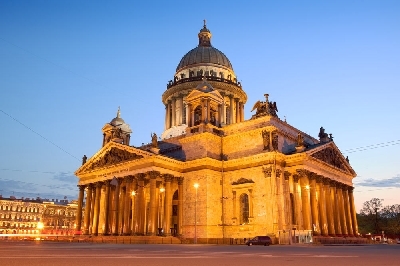 Saint Isaac's Cathedral is one of the main sights of the "Northern capital", which amazes with its beauty and sizes. For all comers inside the cathedral it is possible to order an excursion for both, groups and individuals. Also, you can use audio guide service to learn about the history of the cathedral and its inner decoration and particular features. 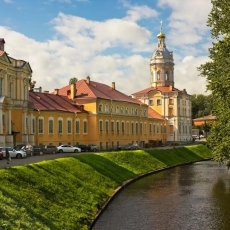 The cathedral was consecrated in honor of the Saint Isaac of Confessor (Isaac the Dalmatian), which was highly esteemed by Peter the Great. Per se, Saint Isaac's Cathedral is the museum complex since 1991, but services are held here during the Orthodox holidays. 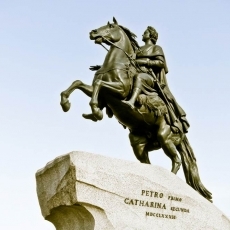 Besides, in 1712 the wedding ceremony of Peter the Great and Catherine Alekseevna took place in the first building of the cathedral. Russian Orthodox Church never gave the special status to the cathedral, so that is why it is not officially a cathedral, however, known all over the world as Saint Isaac's Cathedral. 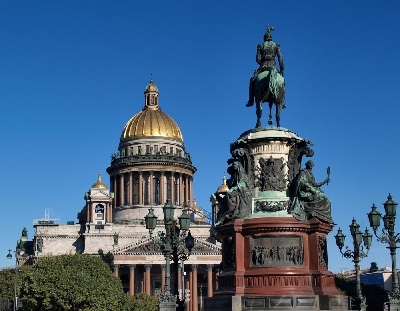 The construction of Saint Isaac's Cathedral began in 1818 and lasted for forty years! 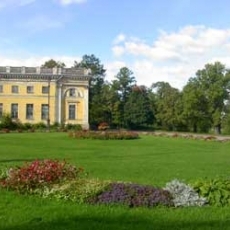 It was finished in 1858. The main architect is considered to be Auguste de Montferrand, but, of course, not only he took part in such a scale construction, but also a lot of key persons of that time. That fact seems to make some special impact in to the image of the building, bring some extraordinary energy to its facades. The colonnades are adorned with the figures of twelve apostles, which rose up to the arches and appeared around the cupola. White facing marble, paintings and mosaics, canvases and frescos - the number of masterpieces exceeds all real expectations. There are three altars in the cathedral, which are worthy of notice. It is hard to describe such things, which when you look at them, you just lost the ability to speak. Inside the cathedral you also can see the prototype of scaffolding, which was used in lifting and setting up of colonnades process. Each of its colonnades weighted more than 100 tones. Stay here for a while and imagine the scale of what happened here 200 years ago, when this particular walls were about o be erected. 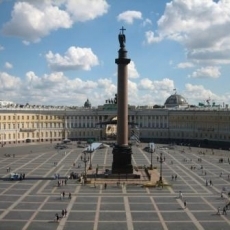 The cupola of Saint Isaac's Cathedral with its great sizes was set on 72 colonnades, at that, they all are monolithic. The colonnades, which were lifted up on a height of more than 40 meters - is a real miracle of the engineering. After all, even modern technologies are not always manage to solve such difficult tasks, so there is no need to tell how hard it was to do it that time. 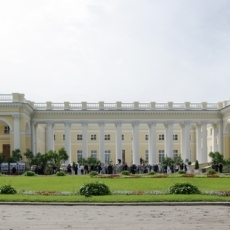 The unique view, which is famous not only among citizens, but also numerous tourists of the city, opens up from the colonnade over Saint-Petersburg. 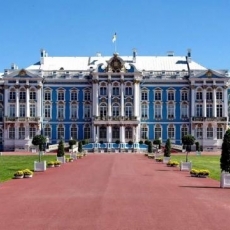 The whole centre of Saint-Petersburg lies spread before the eyes - the Neva River, the Admiralty, Mariinsky Palace. However, you should remember that the height of the colonnade is 43 meters, almost 600 steps and it is better to count on your strengths only. The weather in Saint-Petersburg is always unpredictable, so even during summer time, you may need some warm cloth, just in case. 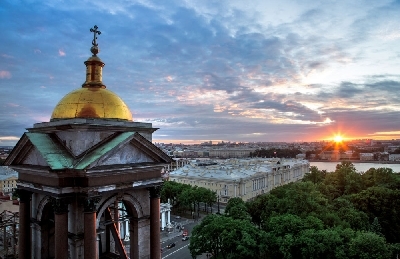 Saint Isaac's Cathedral by its height can be compared only to the Cathedral of Christ the Savior in Moscow with 103 meters height, which is just 1.5 meters higher than Saint Isaac's Cathedral. Thus, it was the second highest Orthodox church in the world and the oldest one as well. There are the analogies with the St. Peter's Basilica in Rome, St. Paul's Cathedral in London and St. Marie Cathedral in Florence. Saint Isaac's Cathedral yields to its counterparts by its sizes, but in the sphere of engineering and constructing technologies Saint-Isaac's Cathedral takes the lead over them, as well as the whole engineering of its time. 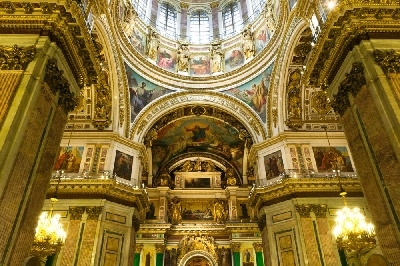 As well as many other churches, Saint Isaac's Cathedral was plundered during the first days of the revolution in 1917, after which not the best times began. In 1921 the cathedral was closed, and in the beginning of 1930s severely and ironically the first antireligious museum was opened here. During the war building was damaged by shelling and bomb attacks. Even today you can see the signs of shell and bomb hits on the facades of the cathedral. After the war the cathedral worked as a museum up to 1948. In 1950s the scale reconstruction was held and renewed cathedral opened its doors. In honor of the sixtieth anniversary of Victory the exposition, which consists of the displays, which were brought from the city's and suburb's museums, was set in the cathedral. 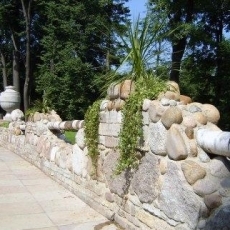 It is dedicated to the Great Patriotic War and the Siege of Leningrad.